Recently, I have been working more in the new U.S. Soccer courses and the importance of observation has stood out to me. First, when I say the “new” U.S. Soccer coaching courses, this means the grassroots courses which include 4v4, 7v7, 9v9, 11v11 and D courses. I am also in the developmental period of the grassroots instructors course, which is now required to teach the courses. The grassroots courses use a session plan that is in the Play-Practice-Play model. This P-P-P model, in general, begins with playing small sided games then a practice phase, followed by a larger game to end the session. The structure of the session allows the players to play while the coach uses different techniques, including guided questions, throughout to “lead” the players to understand key words and the player actions required, based on the session objective. As a coach, anytime that I can try a different technique to increase the understanding of the game to players, I’m in! Before I dive too deep, I do want to point out that this model is only one way to structure a training session. I often use different organizational structures for training sessions. Often times, as a coach you don’t “feel” like your coaching if you are “just observing.” Coaching is shouting and giving the players information throughout the training session, correct? Throughout periods in my training sessions I find myself controlling the players like FIFA 19. I had organized the training session with an overall objective, the training session was designed for the players to “solve” the situation. Throughout the training session, my constant coaching would give the players all of the answers. Then the game would arrive, I would take a seat on the sideline and wonder why the players are struggling to solve the same problems we covered in training. The game was missing one crucial piece, I wasn’t standing on the field giving them the answers. This is when I realized something else needed to happen. Observation! The definition of the word is literally, “the action or process of observing something or someone carefully or in order to gain information.” The key for me in this definition is, “in order to gain information.” I have been using observation more and more in my training sessions and allowing the players to “play” for longer periods throughout training sessions, the result has been eye opening! The training session is still organized with a specific topic and objective. Now, instead of giving the players the answers, I observe as they try to solve the problem and pay attention to how they try to solve the problem. These periods of observation give me great insight into what the players understand in relation to the topic. After the observation period, I am able to provide more specific coaching points through questions to guide the players but allow them to solve the situation. Also, key in these moments of observation, is the ability of the players to communicate with each other! Often times, coaches say the following lines: “I need more communication!, Why am I the only one talking?” Possibly, the players have no ¨space” to communicate. In conclusion, my action plan for coaching is to use more time observing in training sessions. This will give the coach more insight into what the players understand. Then, after observation, the guided questions and coaching points can be more specific and impactful. After all, isn’t the goal of the training session to prepare the players for the game? This team training exercise is focused on developing the timing and understanding of when and how to make runs behind the defense to create goal scoring chances. Below are 2 exercises for small group passing to teach passing technique and interplay. These exercises are designed to focus on passing technique over short to medium distances. You can always vary these exercises to encourage 1 touch play or type of service into the players. 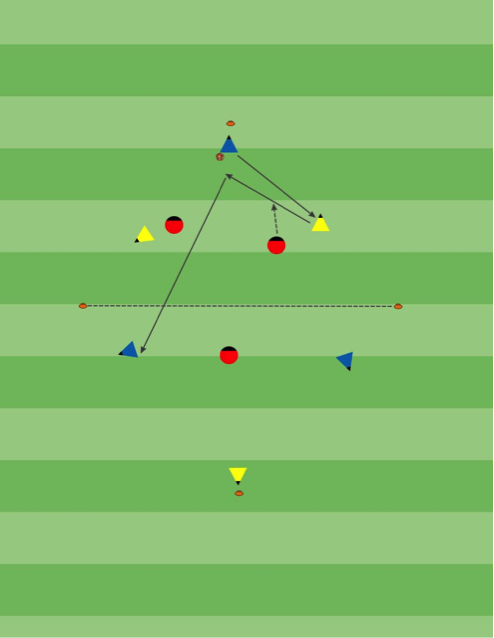 The movement in opposite directions after the first pass is used to teach players about finding a passing lane to support the player in possession. 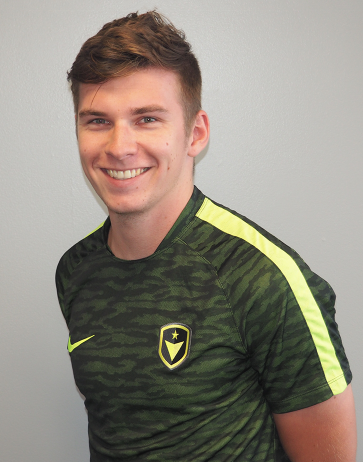 Marc-Kevin Schwenk is currently coaching at Queen City Mutiny (qcmutiny.com) and taking his USSF "C" License. He grew up in Berlin, Germany playing at Hertha 03 Berlin for his youth soccer then played collegiately at Queens University (Charlotte, NC) and Gardner-Webb University. Below is a session that Marc-Kevin said they typically use with the U13 U.S. Development Academy at Queen City Mutiny. Setup: Create a diamond shaped grid, that is 20 yards wide and 40 yards long, that will be divided into 2 halves. We use this shape to force our players to create passing lanes diagonally, which are a key in our style of play. Organization: 3 team rondo (6v3). In one half, there will be 1 player from one team and 2 players from the second team and vice versa in the other half. The third team is in the middle, while only 2 players can go to defend the side that the ball is on. Players are allowed to combine with any player in their half, but can only play with their teammate when switching the ball to the other side. If the team in the middle wins possession, the team that lost the ball will defend. Variations: This is an exercise we start using with our U10s up throughout all academy ages, and therefore adjust it based on the level of play. For our older players we tend to make the grid smaller to force a higher speed of play and depending on the objective of the training may restrict their touches. Guest Blogger - Arjun Jung tells about his experience with the Panjab National Team as they prepare for the CONIFA World Cup this May. Using statistics from the last 6 years of Manchester United in the Premiere League I compare Jose Mourinho’s 2017-2018 with the previous seasons. This is an individual session designed to focus on dribbling and passing. In the first exercise we looked at the 8 and the 10 and their ability to combine with the wide players on each side of the field. When building up from that exercise we now add in the #9 and #6 so that the #8 and #10 have a definite area to work in to find space. In the games over the season Manchester City have been very good at finding the space between the defensive lines of the opposing team. In this exercise it is determined that the #8 and #10 find that space, but that is not always the case. As you will notice when watching the Manchester City game the player may interchange positions but what is important is that someone is taking up the space between the lines and other are taking up the wide and high spaces on the field. This is exhibited in the photo below. In this instance Sterling has moved inside to occupy the space between the defensive lines. Notice there is a player in the wide channel, along with Aguero higher up the field to create a threat in behind the defense. Setup: Using just over 1 half of the field, play 8 v 8. The Blue team will be attacking 1 large goal with the defending red team attacking 2 smaller counter goals. Also within the half place 2 10x10 yard grids as a guidance for the #8 and #10 of where the find space between the lines. These boxes are just guides and there is a not a mandatory station in these boxes. 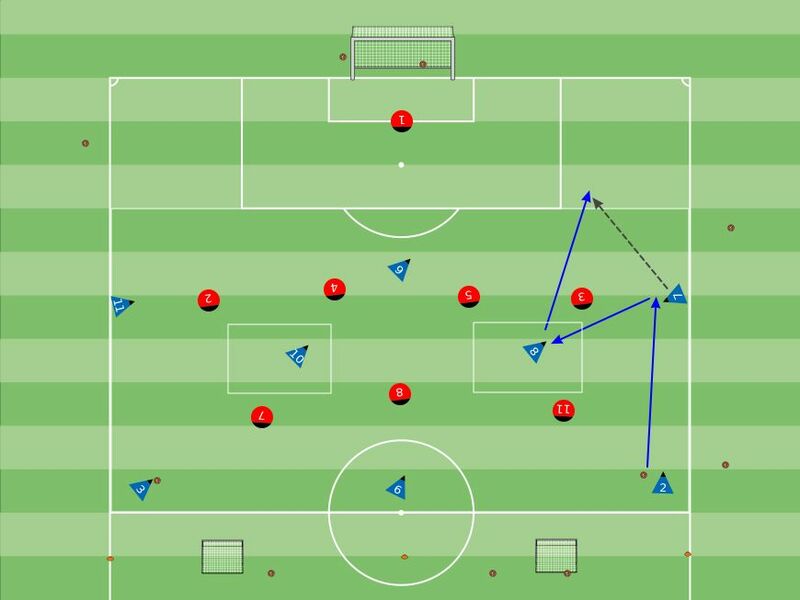 Organization: The attacking blue team looks to find the spaces between the back and midfield lines of the red team to create penetration opportunities. The Red team should try to win the ball and play into the small counter goals. Encourage the blue team to press to win the ball back as soon as possession is lost. Also, be sure to encourage the red team to defend about 10 yards outside of the 18. This will create pressure on the ball and force the blue to find the space. Variations: To encourage the midfield 3 to work together you can add a #4/#5 for the Blue team and a #10 for the Red team so that the #6 is not last defender and can interchange positions with the #8 and #10. Coaching Points: Encourage the players to keep their heads up and look for the space on the field. There should allows be 1 player on each side occupying the wide zones of the field to ensure the team can move the ball side to side. Talk to the #8 and #10 about the timing of the movement into space so that they arrive in space when the player with the ball has taken a first touch and is ready to pass the ball. Once the players receive the ball facing forward in the space between the lines coach the players on runs behind the defense and the type of passes that can be used to penetrate the back line. This session is focused on the wide functional groups of the (#7, #8, #2) and (#11, #10, #3) to increase their ability to find space and combine in order to create penetration in the wide zones of the field.